If you watch my twitter feed or are a facebook/myspace friend, you probably noticed that yesterday was my birthday and that I have now marked the end (and new beginning) of another year. This past year was a busy one. A lot of new and exciting things happened in my writing career and in my personal life. One of the biggest highlights is, of course, the release of Once Bitten, but many other events have occurred which will likely affect the coming year. Not everything from the past year has been great, there are lots of aspects of myself and my life I hope to change, but overall, it was a good year. 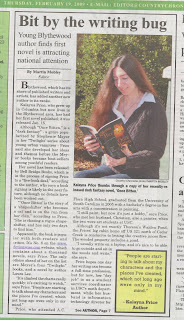 You might remember me mentioning the fact I was interviewed by my local small town paper last week. Well, the article came out yesterday and I made the front page! Today I went to a rather dull training session for a new program I'll be using on the job some day in the unknown future. Most of the other attendees appeared to be as enthused about the two hour session as I was, and after the third technical error, I realized this was a good time to do a little discreet people watching. Nothing too extraordinary or out of the ordinary in this bunch of bored mannerisms, but it is always a good idea to keep a running list of possible non-verbal communication cues. After all, characters are made of many small things. What body language have you observed recently? I blogged on my shopping trip last Friday, but I wasn't very explicit on what I actually purchased. I picked up a couple books that were right up my alley on topics I love, such as The Secret Common Wealth of Elves, Fauns and Fairies (which I already own a copy of, but this one had sketches and a couple other 'perks' my copy doesn't include.) What I'm really excited about though, are the history books I purchased. Okay, first of all, I have to say that History was never my favorite subject in school. It's not that I abhorred history, it just didn't particularly interest me unless it was presented within the context of say, mythology, religion, or art. I'm not great at dates and names, so while I have a general understanding of the major events which occurred in the past, I'm rather clueless on the specifics. And, well, that has always been okay. Happy Friday the 13th (as one of the grad students just pointed out to me.) It would probably be more traditional to write about superstition or gloom and doom today, but I'm not going to. For one thing, as mentioned previously, thirteen is my favorite number. For another, I've had a fabulous day thus far. I took the morning off work because I had an interview with a small local paper about Once Bitten. I was really nervous, but the interview went great. I actually had a lot of fun talking about the book and about writing. The article will be out next Thursday, and I can hardly wait. After the interview, I was giddy and feeling rather fearless, so I did what I'd been meaning to do for weeks. I went to the local Barnes and Noble to arrange a signing. I was told the manager wasn't in yet but should be shortly, so I could wait for her. Okay, I know I'm the last person on the internet to do this list, but people keep tagging me so here it is: 25 Random things about me. 3. Ninety-eight percent of the time I don't like TV and consider it a waste. 4. I prefer to read books cover to cover in one sitting. 5. At least twenty plants have accumulated in my office and I have miraculously managed not to kill them despite my very un-green thumb. 6. I always wanted to play the part of Christine Deea on Broadway. Unfortunately, I can't sing. 7. I believe Tazo Passion tea is the nectar of gods. 8. Dragons are the best animal ever. Once Bitten #8 on Dark Fantasy List! To celebrate, my publisher released a new version of the Once Bitten book trailer detailing this information as well as including some quotes from reviews. Enjoy! Thanks everyone, and have a good night!